Capcom Says Resident Evil 6 Will Be "Different"
Capcom's popular horror shooter franchise could be getting another revamp for the next go-around. For all its popularity, Resident Evil has had a difficult time establishing its own identity in recent installments. Resident Evil 4 was a groundbreaking change in the series, sacrificing some of the horror elements for gameplay that was, you know, actually fun - and Resident Evil 5 moved further away from the series' roots. What about the next one? 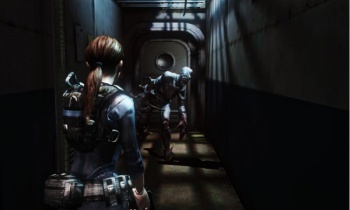 In an interview with Spanish-language publication MarcaPlayer, Capcom producer Masachika Kawata said that Resident Evil 6 would represent another step for the franchise. "The series will see a complete renovation with the next entry on every level," said Kawata. "But we can't forget about all the previous entries that have led to the creation of many possibilities for the franchise. I can't say if we're going to make [Resident Evil 6] survival horror or a shooter, but I can say that it'll be totally different." It's interesting to note that from this quote, Capcom is well aware of the survival-horror-vs-good-shooter dichotomy that recent Resident Evil titles struggle with. There's no question that the gameplay alterations in RE4 made it a better game, but Capcom needs to ask itself: Should Resident Evil be fun to play and a competent shooter, or should it be scary?